Just to be on the safe side, you’ll want a buffet full of all kinds of sweets to nibble on. We’ve got a full, fabulous menu for you below with beautiful photos of each recipe from White Loft Studio. 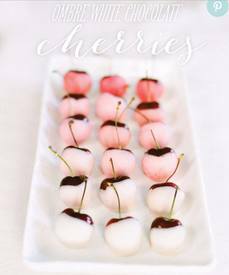 You’ll notice that the Cherry is definitely the “it girl” of our Valentine’s party buffet, and what could be more romantic?